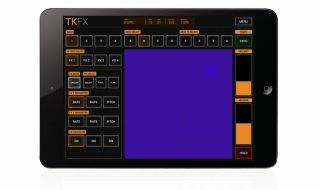 TKFX is a new iPad app designed to offer DJs wireless touch control over various elements of Native Instruments' Traktor. The app is focussed around a large X/Y pad, which can be assigned to control the parameters of any of Traktor's built-in effects, and then applied to any of the software's decks. According to its developers, the app is pre-mapped to be entirely 'plug-and-play' and offer intuitive integration with any Traktor set-up. TKFX is a 'freemium' app, meaning that it's free to download in an entirely useable state, but requires in-app purchases to unlock the 'unlimited' modes of each of its features. Off-the-shelf, the app comes with a single bank, single effect unit, single deck, single effect parameter, three effects and one single effect function button. TKFX is available for download via the App Store now. For more info visit the TKFX site.